The other day I wrote about how French social climbers tend to be suspiciously hyper-catho, while for many years, probably not any more, Americans social-climbed in the Episcopalian church. That reminded L., who works in the entertainment business, that things are similar out here in L.A.
"Networking at the synagogue. Everyone goes." At dinner here in Paris last night, I listened to an fervid discussion about the Pope. This is not a subject that arises much in West L.A., but much of the French upper class is passionately Catholic. I have always seen this as partly a class thing-- much as Americans who wanted to rise in the world used to start going to the Episcopalian church. The socialists are devoutly secular. I remarked that Jean-Paul II did not seem to sympathize much with people in the Western democracies, particularly Americans. He grew up with little experience of democracy, under Nazis and Communists. "Ah, that is where you are completely in the wrong," said a second man. "Every morning the Pope spent two hours talking about Americans." Today is the first day of Hanukkah. In Paris, I often noticed elegant Jewish families on the street, walking to the temple on the holidays, the men in dark clothes, the women in hats and sometimes wigs, and the children, all dressed up, running ahead excitedly. In Los Angeles, a huge proportion of the entertainment business is Jewish, but they're much more secular than most of the Jews I knew in Paris. They're ethnically Jewish, but not religious. There are so many mixed marriages that rabbis are dismayed, and call intermarriage the "silent killer" of Jewish families. My friend Charles had a grandmother whose family was killed in a pogrom. She was twelve and survived by hiding in a haystack, which the Cossacks probed with a pitchfork. She later made her way to Danzig, where she had an uncle, and he sent her to America. Charles, though, never seemed to date Jewish girls. At one point, his grandfather became so desperate that he offered to pay for the date any time Charles took out a Jewish girl. But Charles married an Episcopalian anyway. 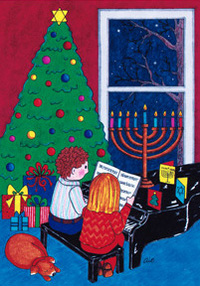 This has become so common that I found a whole collection of Christmas-Hanukkah cards in a drugstore near my house. In France you always knew when it was Ramadan. The small storekeepers who observe the fast (it's recent that most of them do) get cranky and scold each other if one smokes or drinks. 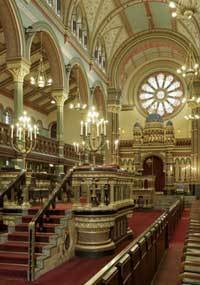 We lived near a conservative (not Orthodox) synagogue and on Fridays and holy days we often saw handsomely dressed Jewish families walking through the neighborhood, the fathers in long black coats, the mothers in wigs, the little boys skipping down the sidewalks sometimes wearing baseball caps to disguise their yarmulkes. Here in Los Angeles, quite a few of the private schools are closed for Rosh Hashanah and Yom Kippur. Because of the Holocaust, many young Europeans have never met a Jew. I had a Hungarian au pair once who used to make anti-Semitic remarks. One of the three people who gave me a no doubt unjustified prejudice against the entire Hungarian race. (Before you criticize me for keeping her on, let me ask you if you have ever known what it was to be desperate for a babysitter? And she had to speak English and French.) Each time, I would sharply correct her and she would say she was sorry. The last straw. I snapped, "Gabriela, have you ever even met a Jew?" "Yes," she said. "Once I went out to dinner with a bunch of students in Budapest, and one of the people at the table was a Jew!" Years later, I got a letter from Gabriela. She was obviously going to one of those twelve-step programs. She wrote me a long, psychotic ramble about all the times she had been angry with me and the children, including the time D accidentally handcuffed her and the firemen had to cut the handcuffs off with four-foot shears. But she apologized about the Jews. She wrote, "I have become a Christian and I am sorry I said those things about the Jews. They are God's chosen people." A few years ago a Spanish newspaper ran an ad against anti-Semitism. It featured pictures of Einstein, Mendelssohn, Freud, Jonas Salk, Elias Canetti, Marc Chagall, and Jesus. Underneath the caption said, "So you think you are better than these people?"